PEBBLE BEACH, Calif. – July 12, 2016 – Automotive Fine Arts Society (AFAS) member Jay Koka will unveil two automotive paintings that feature European exotic cars at the Pebble Beach Concours d’Elegance® on Sunday, Aug. 21, 2016, from 9:00 a.m. to 4:30 p.m., in Pebble Beach, California. Koka, a master of impressionist art, is known for his ability to manipulate color and mood to create automotive masterpieces. Sponsored by The Lincoln Motor Company, the 2016 AFAS exhibit at the 18th fairway of Pebble Beach Golf Links in beautiful Pebble Beach, California, will showcase the latest creations from the world’s finest automotive artists. One of Koka’s paintings on display, is a 44” x 60” acrylic on canvas titled “918 on Ocean”. 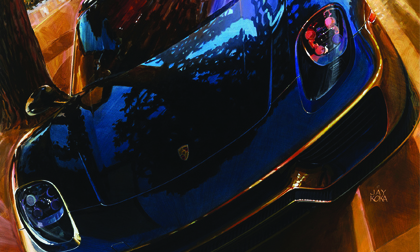 Set in beautiful Carmel, California, the painting features a Porsche 918 parked on Ocean Avenue. The 918’s powerful headlights immediately capture the eye. The combination of approaching cars in the background along with the magnificent sports car, create a magical effect that casts a veritable rainbow of complex colors on the entire scene. Adding the reflection of taillights on the front of the 918 result in an interesting balance of colors from corner to corner of the painting. Koka’s second painting titled “Breathless in Shanghai” is a breathtaking 60” x 44” acrylic on canvas. This painting features a Rosso Corsa Ferrari 488GTB enhanced by a captivating model pictured on the side of a building wearing emerald jewelry. Koka uses bold techniques and vivid imagery throughout the piece that are meant to leave viewers breathless. It is an exceptionally striking painting, not only because of its size, but also because of the colors that make it hard to ignore. Jay Koka is a recognized leader in automotive fine art with clients worldwide. A winner of many prestigious art awards including the Peter Helck Award, he is a 28 year member of the Automotive Fine Arts Society and serves on the Board of Directors. He has been the featured artist and poster artist for a wide range of major international events like the Pebble Beach Concours, the Concours at St John’s, the Daytona 500, the 24 Hours of Daytona and especially well-known in Ferrari circles with thirteen posters for the Ferrari Club of America including their 50th anniversary. In 2016, Koka’s Studio released a hardcover book titled: “30:30” to mark its 30th anniversary. The 96 page book features an in-depth biography, studio activities coverage and a gallery of 30 selected images. Koka lives with his wife Cathy near Toronto. The studio site www.jaykokastudio.com features an in-depth look at his work.